This item has been discontinued. Please see for replacement. Add a topcoat layer to protect your cards. The Datacard 806124-106 YMCKT-KT full color printer ribbon consists of Yellow (Y), Magenta (Magenta) and Cyan (C) panels for high-quality, full-color card prints. It features two black resin (K) panels for printing barcodes and black text on either side of a card. The color ribbon also includes two Topcoat panels for adding a protective overlay to your cards for added durability and extended card life. 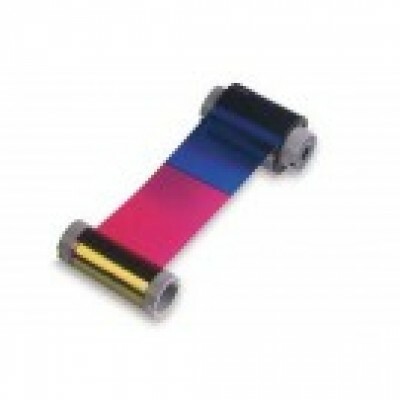 It has a printing capacity of 95 images per roll . Datacard ribbons are printer specific.To maximize card quality and your Datacard printer's life expectancy and durability, use only genuine Datacard ribbons.